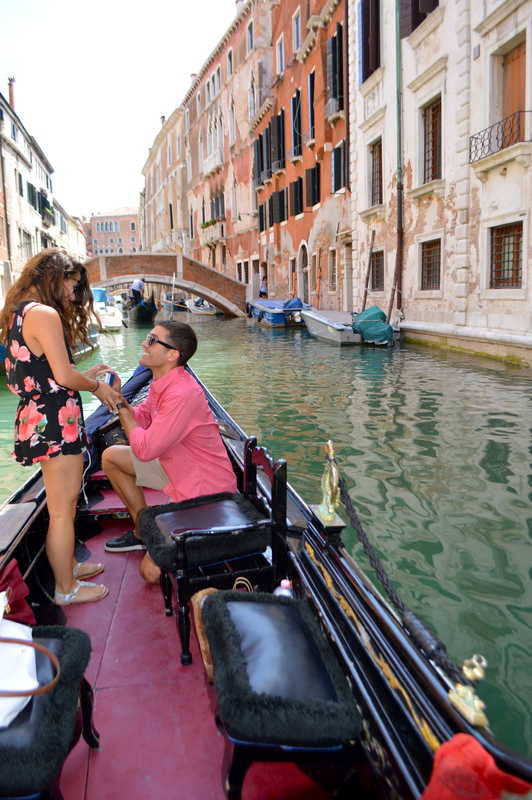 Exactly 30 days ago the man of my dreams proposed to me in Venice, Italy! I can’t think of a better way to celebrate this than to share our special moment with my followers. Sean is the most handsome, special, and caring soul I have ever come across. He makes me feel so at ease, so incredibly loved, so beautiful, so safe, and so special. I am so thankful God brought him into my life. I thank him everyday because it is truly such a blessing. I promise not to get too sappy in this post, but the love I have for this amazing man is unexplainable. Before meeting Sean, I always use to wonder how and why people would say, “OMG like I’m going to marry my best friend, OMG” Honestly, I thought this comment was kind of annoying because I couldn’t relate. I honestly thought that it was impossible! I have my best girlfriends. How could a guy become a best friend? But falling in love with Sean changed it all. He did not take over my best friends’ role of being my best friends, he became my partner, my confidant, my everything….so much more than a best friend. Anything I could ever want in a best friend, he became, and it is so much better than that because we share a one of a kind love that I get to cherish my entire life until we are old and frail. We know I am a hopeless romantic, this is not new news. I have always been a believer in true love, and I believe everyone will find it. However long it takes. I have finally found my forever love. To say Sean and I are happy is a serious understatement. We laugh in normal conversation because we have fallen more deeply in love since our romantic proposal….in just 30 days. When my parents renewed their wedding vows on their 25th anniversary in Kauai, they said they loved each other so much more than the day they got married. I wondered again how that could happen when “you are the most in love on your wedding day.” I was wrong again. Love teaches your young soul so many things. In just 30 days, I have loved Sean more than when he proposed to me, and a heck of a lot more than when I first told him I loved him on January 2, 2012. I can’t wait to love him more and more each day until our hairs turn as grey as our silver fox, Tucker (cue laughter). I love you, Sean. Thank you for changing my life for the better each and every day. Thank you for being mine.